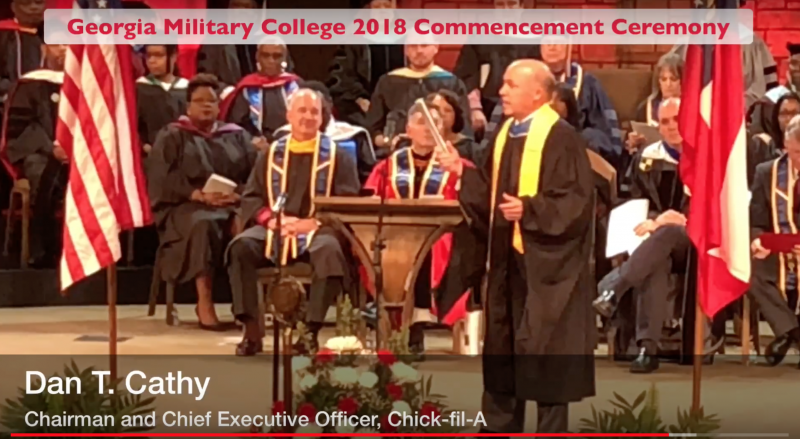 Dan Cathy, Chairman and CEO of Chick-fil-A, challenged 206 graduates from three Georgia Military College campuses to pick up the baton and live a remarkable, “tweetable” life in a commencement address on Saturday, June 2. Graduates were from three campuses in the greater Atlanta Metropolitan area: 130 from Fairburn, 57 from Fayetteville, and 19 from Stone Mountain. The class along with family members and friends filled every seat and spilled into the foyer at New Hope Baptist Church in Fayetteville. Introducing Cathy, Georgia Military College President LTG William B. Caldwell, IV, US Army (Ret. ), said the Fayetteville campus of GMC exists because of Cathy. One of the nation’s best-known businessmen addressed graduates standing in the sanctuary of the church where for 17 years he taught 11th and 12th grade Sunday School classes. He heads an organization which, according to Cathy, employs 100,000 young adults age 17 to 22 across America. “Embrace all of it,” the CEO encouraged, as he noted the dramatic change every industry is facing. “I’m a lifelong learner,” he said, encouraging students to be lifelong students of change, to perpetually redefine who they are. “Redefine who you are but not whose you are,” Cathy said. Why does Chick-fil-a want to have a relationship with their customers? 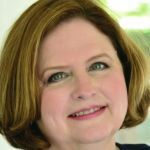 “Because it’s a part of our corporate purpose to glorify God by being a faithful steward of all that’s entrusted to us and to have a positive influence on all that come in contact with Chick-fil-A,” Cathy said. “Your life is about having meaning and influence on a society and culture that is desperately in need of the skills that you have received from Georgia Military College,” Cathy said. Cathy described commencement as “one of the great ceremonies in civilization,” as a time when a baton is passed to graduates. “Succession is all about a really great baton handoff,” he said. Dan Cathy personally passed a baton inscribed with the words “Be Remarkable” to each graduate as they crossed the stage to pick up their associate degrees. His final words of advice?